Catoosa County Attorney Clifton "Skip" Patty discusses details of a pending property sale between the county and the Georgia Forestry Commission during a Nov. 20 meeting. Catoosa County officials say they're close to selling a tract of land to the state for construction of a new Georgia Forestry Commission ranger station. In June, commissioners first discussed selling the property, a four-acre tract off Bandy Road near McGill Lane. The county acquired the property, which is a portion of an 11-acre tract, after it was condemned by the previous owner. The county also had to spend money and time cleaning the property up, as well as sort out the title issues before a sale could take place. During the Nov. 20 Board of Commissioner's meeting, County Attorney Clifton "Skip" Patty said the title issues are almost ironed out and that the sale could be completed by the end of the year. "We've approved this sale before in general terms, but this particular contract fills in all the blanks and makes the option to purchase official," Patty said. "The purchase price of the four-acre tract is $20,276. Patty says the county filed for a quiet title action on Nov. 16, and that the sale can be completed 30 days after that date. Throughout the whole process, Forestry Chief Ranger Seth Pierce has been complimentary of the board for its support in trying to get the new station built. During the meeting, he said that the new station could be operational within a year and a half. On Dec. 4, friends, family and dignitaries gathered at the Ringgold Depot to wish Catoosa Chamber of Commerce President and CEO Martha Eaker the best as she retires from her 12-year position. From left: Catoosa County Commissioners Jeff Long, Jim Cutler and Ray Johnson; Martha Eaker; Catoosa Commission Chair Steven Henry; Uniktings owner and Chamber member Cindie Robinson Patty, who presented Eaker with the Tiffany bracelet the Chamber bought for her. 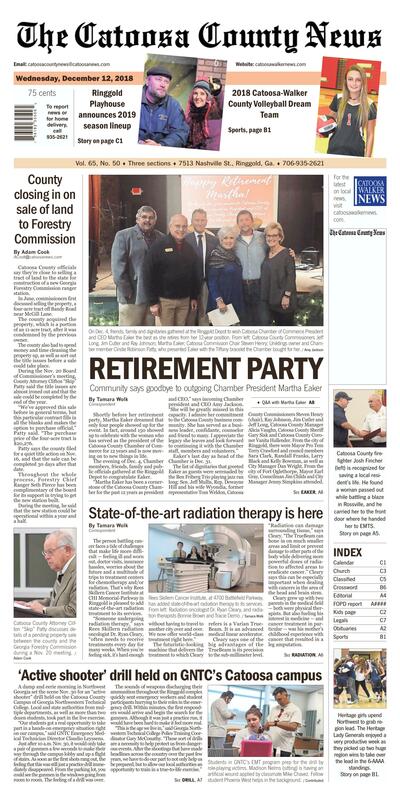 Over the course of the evening on Dec. 4, 150 people attended a party to wish retiring Catoosa County Chamber of Commerce President and CEO Martha Eaker the best of luck and to thank her for her 12 years of work with the Chamber. Shortly before her retirement party, Martha Eaker dreamed that only four people showed up for the event. In fact, around 150 showed up to celebrate with the woman who has served as the president of the Catoosa County Chamber of Commerce for 12 years and is now moving on to new things in life. The evening of Dec. 4, Chamber members, friends, family and public officials gathered at the Ringgold Depot to congratulate Eaker. "Martha Eaker has been a cornerstone of the Catoosa County Chamber for the past 12 years as president and CEO," says incoming Chamber president and CEO Amy Jackson. "She will be greatly missed in this capacity. I admire her commitment to the Catoosa County business community. She has served as a business leader, confidante, counselor and friend to many. I appreciate the legacy she leaves and look forward to continuing it with the Chamber staff, members and volunteers." Eaker's last day as head of the Chamber is Dec. 31. The list of dignitaries that greeted Eaker as guests were serenaded by the Ben Friberg Trio playing jazz ran long: Sen. Jeff Mullis, Rep. Dewayne Hill and his wife Wyondia, former representative Tom Weldon, Catoosa County Commissioners Steven Henry (chair), Ray Johnson, Jim Cutler and Jeff Long, Catoosa County Manager Alicia Vaughn, Catoosa County Sheriff Gary Sisk and Catoosa County Coroner Vanita Hullender. From the city of Ringgold, there were Mayor Pro Tem Terry Crawford and council members Sara Clark, Randall Franks, Larry Black and Kelly Bowman, as well as City Manager Dan Wright. From the city of Fort Oglethorpe, Mayor Earl Gray, Councilman Jim Childs and City Manager Jenny Simpkins attended. A long list of business owners who are Chamber members also attended the Chamber-hosted party. Eaker's husband was there, along with her grandson, her son and his wife, and out-of-town friends. As with all good parties, there were surprises. Chamber members contributed to present Eaker with a five-night stay in a condo on St. Simons Island. Eaker was also presented with a sterling silver bracelet from Tiffany & Co. The bracelet was engraved with letters matching the license plate on Eaker's car — SALA V, a twist (suitable for a license plate) on the spelling of the French phrase c'est la vie (pronounced SAY LAH VEE), meaning "such is life" or "that's how life goes." "Martha has served the Chamber with distinction," says Chamber member and ambassador Terry Isaac, owner of NextHome Plus. "There are over 7,000 Chambers across the U.S. and just over 200 are accredited. We are one of those thanks to Martha's efforts. Martha is looking forward to retirement and having more time for family and friends, but I know she will remain active in the community. I look forward to seeing where she pops up next." The event was funded by donations from Chamber members. It was catered by Belaire Catering of Chattanooga. Bar services were provided by Peppers Fresh Mexican Restaurant of Ringgold. Rees Skillern Cancer Institute, at 4700 Battlefield Parkway, has added state-of-the-art radiation therapy to its services. From left: Radiation oncologist Dr. Ryan Cleary, and radiation therapists Bonnie Brown and Tracie Demo. The person battling cancer faces a tide of challenges that make life more difficult — feeling ill and worn out, doctor visits, insurance hassles, worries about the future and a multitude of trips to treatment centers for chemotherapy and/or radiation. That's why Rees Skillern Cancer Institute at CHI Memorial-Parkway in Ringgold is pleased to add state-of-the-art radiation treatment to its services. "Someone undergoing radiation therapy," says Rees Skillern radiation oncologist Dr. Ryan Cleary, "often needs to receive treatments every day for many weeks. When you're feeling sick, it's hard enough without having to travel to another city over and over. We now offer world-class treatment right here." The futuristic-looking machine that delivers the treatment to which Cleary refers is a Varian True-Beam. It is an advanced medical linear accelerator. Cleary says one of the big advantages of the TrueBeam is its precision to the sub-millimeter level. "Radiation can damage surrounding tissue," says Cleary. "The TrueBeam can hone in on much smaller areas and limit or prevent damage to other parts of the body while delivering more powerful doses of radiation to affected areas to eradicate cancer." Cleary says this can be especially important when dealing with cancers in the area of the head and brain stem. Cleary grew up with two parents in the medical field — both were physical therapists. But also fueling his interest in medicine — and cancer treatment in particular — was his mother's childhood experience with cancer that resulted in a leg amputation. Cleary earned a degree at the University of Kentucky College of Medicine and did his residency at Vanderbilt University Medical Center. "The thing I like about working as a radiation oncologist," he says, "is that I see patients over a long enough period of time that I get to know them as people and build a relationship with them." Before radiation therapy, a patient meets with Cleary to discuss treatment and a plan is formulated. If a tumor is particularly troublesome, Cleary can present the case at the daily "Tumor Board" held by area doctors to discuss particular cases and benefit from one another's experience. Once Cleary has worked out a plan for a patient, he goes over the details with the radiation technicians who are trained to operate the TrueBeam. The TrueBeam is housed in a room with a door and walls a foot thick and lined with lead. Cameras are mounted around the walls to keep an eye on the patient. The True-Beam is programmed to a minute level of sensitivity, to the point that it can fashion beams of radiation that fit the size and shape of a tiny tumor. The machine can rotate completely around the patient. A medical physicist on staff monitors the machine to make sure it delivers the proper amount of radiation. Cleary says that yet another advantage to the Varian True-Beam is that it reduces the amount of time radiation treatments take. "A patient can be in and out, from the moment they walk through the front door, in 20 or 30 minutes. It's much faster than options in the past." CHI Memorial marketing representative Karen Long says that Rees Skillern Cancer Institute will be adding chemotherapy treatment to its services in the near future. Students in GNTC's EMT program prep for the drill by role-playing victims. Madison Nelms (sitting) is having an artificial wound applied by classmate Mike Chavez. Fellow student Phoenix West helps in the background. A team of first responders methodically move through the Catoosa County Campus during an "active shooter" drill on Nov. 30. From left: Deputy LeeAnn Moody, Catoosa County Sheriff's Department; Deputy Doug Licklider, Catoosa County Sheriff's Department; Detective Jennifer Jones, Ringgold Police De-partment (GNTC police); and Nigel Torres, Catoosa County Sheriff's Department. Georgia Northwestern Technical College Law Enforcement Academy Director Jim Pledger stands by to role-play one of the gunmen used in the Nov. 30 "active shooter" drill on the college's Catoosa County Campus. Georgia Northwestern Technical College Police Officer Jennifer Jones covers fellow officers during maneuvers in a staircase on the college's Catoosa County Campus. Jones is also a detective for the Ringgold Police Department. A damp and eerie morning in Northwest Georgia set the scene Nov. 30 for an "active shooter" drill held on the Catoosa County Campus of Georgia Northwestern Technical College. Local and state authorities from multiple departments, as well as more than two dozen students, took part in the live exercise. "Our students got a real opportunity to take part in a hands-on emergency situation right on our campus," said GNTC Emergency Medical Technician Director Claudio Leyssens. Just after 10 a.m. Nov. 30, it would only take a pair of gunmen a few seconds to make their way through the campus lobby and up a flight of stairs. As soon as the first shots rang out, the feeling that this was still just a practice drill immediately disappeared. From the parking lot, you could see the gunmen in the windows going from room to room. The feeling of a drill was over. The sounds of weapons discharging their ammunition throughout the Ringgold complex quickly sent emergency workers and student participants hurrying to their roles in the emergency drill. Within minutes, the first responders would arrive and begin the search for the gunmen. Although it was just a practice run, it would have been hard to make it feel more real. "This is the age we live in," said Georgia Northwestern Technical College Police Training Coordinator Gary McConathy. "These sort of drills are a necessity to help protect us from dangerous events. After the shootings that have made headlines across the country over the past few years, we have to do our part to not only help us be prepared, but to allow our local authorities an opportunity to train in a true-to-life exercise." First responders would move methodically throughout both floors of the 60,000-square foot facility searching for the suspects. "Those first on the scene have one main goal," said McConathy. "The goal is to stop a shooter. Those first officers won't stop to assess injuries. With each additional minute that passes that they have not detained the gunman, that's one more life that could be on the brink because of it. You have to stop the threat." Responders from the Catoosa County Fire Department, Catoosa County Sheriff's Department, Dalton Police Department, Georgia Bureau of Investigation, Hamilton Emergency Medical Services, Puckett Emergency Medical Services, Ringgold Police Department, and the Tunnel Hill Police Department participated in the event. "There were even some of the responders who came on a volunteer basis to take part," added McConathy. "It just goes to show just how important this kind of thing is." Although the drill organizers are still breaking down the data from the drill, students on hand had their results immediately. "When the weapons discharged, it grabbed the attention of all of our students," said Leyssens. "I've taken part in several disaster drills. However, this was my first active shooter drill. This drill really helped train emergency responders as well as my students going into the field. I really feel like it has the potential to help keep our campuses safer than others. You just don't hear about a lot of drills taking place like this at other colleges." In Calhoun, Georgia in October 2017, GNTC's Gordon County Campus hosted an Active Shooter Drill. The college's Floyd County Campus was the site of a similar event in 2014 in Rome, Georgia. In 2011, the Walker County Campus of GNTC also hosted a similar exercise in which authorities across the region responded to the drill at the Rock Spring, Georgia facilities. GNTC offers Basic Law Enforcement, Emergency Medical Technician, Criminal Justice, and Crime Scene Investigation programs. For more information on these programs, visit the college at GNTC.edu or by calling 866.983.4682. For more information on the drill, you may contact GNTC Chief of Police Chad Cardin at 706-295-6552. You may also email him at ccardin@gntc.edu. Campuses are located in Ringgold (Catoosa County Campus), Rome (Floyd County Campus), Calhoun (Gordon County Campus), Rockmart (Polk County Campus), Rock Spring (Walker County Campus), and Dalton (Whitfield Murray Campus).